There are a lot of bike riders in the area where I live. You see them year round, in rain, snow, sleet, or hail (oh yeah that was the postal service motto); so maybe the hail part was an exaggeration. 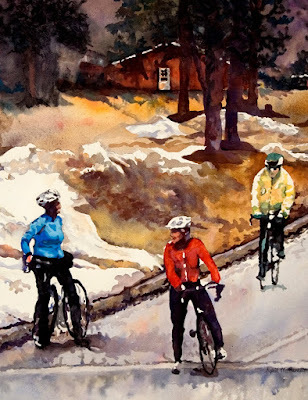 The more I have painted people riding bicycles the more curious I have become about the biking community. Recently I discovered The League of American Bicyclists who are working to improve bicycling across America, inspiring Bicycling Friendly communities, and more. During National Bike Month they advocated a Ride to Work Week across the country. I also learned about the USBRS (United States Bicycle Route System that was established in 1978 by the American Association of State Highways and Transportation Officials. This is the same body that coordinates the numbering of Interstate Highways and United States Numbered Highways. Learning about these groups and inspired by my neighbors, I decided to paint "Morning Commute" as a tribute to these organizations and those who support this work. As a cyclist myself - I must say I love it! Thanks, Sheila. 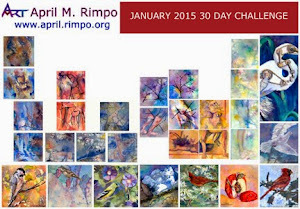 These bicyclist paintings have become a real labor of love.